We have our final three and Derrick is sitting pretty. Victoria thinks she's Derrick's #1 because they allegedly talked day one (doubtful), but Derrick seems truest to Cody if only because the alliance had an official name. The trio celebrate with a final three breakfast where they're forced to rehash a season of memories for a clipshow episode. It's a boring episode but worth it just to see when scrappy, adorable Izzy the dog entered the house. Part 1 of the final 3-part HOH competition is to hang onto a hang glider the longest, but they're not dangling they're angled with feet on a platform and pummeled by rain. Cody and Derrick previously agreed that Cody would take the endurance, then Derrick would move into part two to battle Victoria. But Derrick would rather win part one than risk it, but eventually steps down and agrees to battle the brains of Victoria. Part 2 of the HOH comp has an adorable squirrel in a Pharaoh hat and the entire yard is beautifully themed in an Egyptian temple. Derrick and Victoria compete individually to climb a wall and put the houseguests heads into slots to indicate when they were nominated. And Pharaoh Squirrel gets a tile too - awww! While Victoria should really know who was nominated each week since she was up NINE TIMES, Derrick wins part two. Ultimate Big Brother king and frozen foreheaded god Dr. Will mediates the jury as they hash out who deserves to win. When Beast Mode Cowboy arrives and explains The Hitmen, everyone is more focused on Caleb betraying Frankie than Derrick/Cody being a super pair. The jury all laughs about how brilliant Derrick's game is where he makes you feel guilty about your own eviction, also working the future evicted to work the jury for him. Donny advocates that Cody is a good player who won competitions, and everyone agrees Cody deserves the win too. But Victoria talk is just lots of laughs. Zach wisely speaks up that it's not about who you want to win but who DESERVES to win. Derrick and Cody face off in the live final HOH competition, which is to guess how members of the jury responded to questions. They reused the scale of justice set from last year, because I guess this is a thing now. It ends in a tie breaker question in which Cody becomes the final HOH of the season. Keeping his word, the deal he made since day two, Cody evicts Victoria and brings Derrick with him to the final two. With the final two in place, the jury comes out on stage and gets to question the final two. Derrick admits he played the role of being behind-the-scenes but totally involved in all decisions and insists his family wasn't to be used as strategy. Derrick answers that he went 55 nomination ceremonies without being nominated and Nicole is the person who understood the game he was playing. But Derrick does have to admit he always planned to take Cody to the end and brought her along as long as he could, but their friendship is real. Cody brags to Frankie that it was him that got him evicted and cites the big strategic move he did was saving Zach early on. Cody believes his social game is what got him and Derrick to the end, as he relayed that info to Derrick to make the decisions. In their final speeches, Cody insists he wasn't a puppet and made moves, while Derrick stresses he was never nominated, won competitions, and was integral in all the nominations. And then the jury cast their votes. All the pre-jury houseguests come out on stage and Julie reveals the Team America twist. Derrick also gets to make a big reveal: he's actually a police officer. Even his casting video shows how slick his game has been planned before he even entered the house. And then it's time to reveal the votes! Jocasta and Donny vote for Cody, but the rest vote for Derrick. Derrick is the winner of Big Brother 16! And Donny wins America's Favorite Houseguest, edging out Zach and Nicole, to take home another $25,000. So it's a good day to get super paid for being part of Team America. Ok, Mel Got Served readers, now we reveal who are the winners of this season's Pre-Show Winner Predictions. This season had the most voters ever and I'm so grateful to all who entered and tried to pick. While I beat my week three curse, my man Zach wasn't able to pull it out. However, seven of you smarties picked Derrick to win! 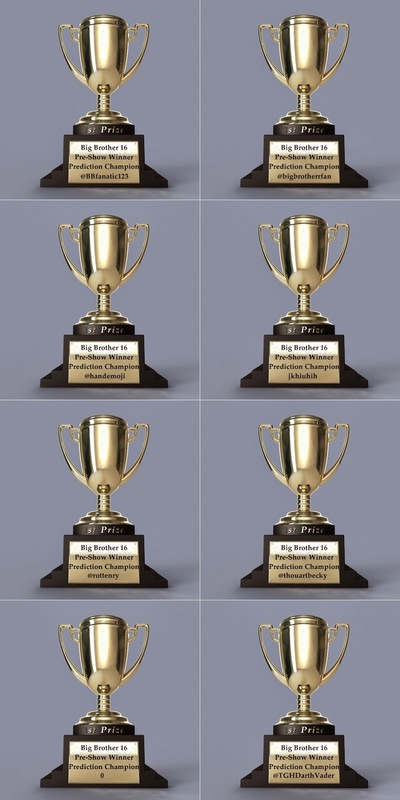 Below are your trophies - congratulations on your victory!